This year I spoke twice at the National Art Education Association conference in Chicago, IL. My first presentation was by myself about my active work with STEAM interdisciplinary education highlighting the direct influences of Maker Education, Reggio Emilia, Computational Thinking, Engineer Design Process, Design Thinking, and Project Based Leaning. I made a PDF of my presentation for download, with student faces covered. My resource page extends on the information I shared in my talk, plus additional resources. Downloading the resources PDF lets you click on all the hot links, so it’s worth having. I had a full house of over 75 people with some sitting on the floor, standing against the walls, and inside the doorway. I received multiple positive responses on my talk and I wanted to give a few tips for anyone looking to speak at a conference in the future. Have a Catching Start: I’ve seen a lot of presentations that follow the same line of thought we were all trained for in High School. Last year, I saw Courtney Bryant present her student engineered “Tinker Yard,” and she started with 5 minutes of silence as we absorbed photos in a slideshow without words. It sparked my curiosity and helped me grasp all of the information being thrown at me. I borrowed that concept and started with a 2 minute slideshow I made in Animoto (free for teachers). Resource Pages: Work Smarter, Not Harder. Creating resources allowed me to focus on what I was going to share and it helps when everyone knows that information shared vocally is in their hands or a click away. Crack Jokes to Dampen the Nerves: Give me 40 kindergarteners and I’ll move myself along, no sweat. Give me 10 of my peers and uh, uh…, umm…yeah. Nerves are real, while I’ve now given 7 professional presentations- I still get them. The best part of Art Education presentations is most people watching you are art teachers; kind, joyful, and empathetic beings. I was cracking jokes outside the room beforehand and right up until I started. Now, I do personally prefer the casual feel, and this helps start it. Talk It Out, Repeatedly: I probably spoke my talk to myself about 30+ times over the last 6 months. I had to shorten it from 120 minutes at VA State Conference to 42 for NAEA. I would speak it in the car, practice over dishes, and record it for playback. If you have a lot of information to share, you need to practice the flow. Presentations are not conversations, but the more you are aware of what your saying, the less you need notes or cues from the visuals. It also helps when you have a lot of information to clearly know what you are saying. Know the “Take Away” for Each Slide: My godfather is a businessman, not an art teacher. Giving a mock presentation to him had me readdress many of the slides. Slides should provide context and defining points. I don’t read off from my slide text, or put an overkill of information. Text and imagery need to work together, and you need to decide what you want the audience to take away from each slide. Decide Ahead of Time Your Physical Presence: I personally don’t like the stand behind the podium and use a microphone method. I hooked my iPad up directly to the center projector and spoke loud. This is a preference to be “in” the audience and forced to see the whole room. I speak the way I teach, I get in front of the projector and I make kinesthetic hand gestures. While it is a preference, I will say that giving yourself permission to move lets you work out nerves as you talk. Device and No WiFi Back Up: I will never trust that we have WiFi at conferences. I prefer to use Prezi because I like the control you get from movement and zoom in/out capabilities. I had a download of my videos and Prezi on my iPad and iPhone. I didn’t need WiFi and could zoom in with my fingers to any picture in question. I will never go back to using a computer for presentations, even with a clicker. Be Respectful of the Next Presenter: Your time ends 50 after? Make it happen. While I had no problem with the ladies before me needing some extra time to pack up, some presenters need to get themselves prepped and relaxed. I had 5 minutes for questions and a packed house. I answered a few one on one and talked with others outside the room, but I wanted the next person to be squared away and let those coming in and out have the transition time as well. You Cannot Control Everything: I like to talk with a closed door. I had enough people that it was not an option. It shouldn’t bother you if people walk in late or walk out early. I got lost myself finding rooms and there is nothing wrong with someone deciding, “This isn’t for me, I need to find a talk better suited to my population and style.” As someone who was in the audience for many talks- silence your phones and respect that someone’s presentation is not where you converse at length. I almost lost it at one woman whose phone rang in a talk and she answered it- in the third row, no less. Then she had a two minute conversation, packed up and left. Be mindful that some presenters worked really hard and you chose to sit in their space. As a presenter, be mindful that a stranger’s rudeness is not reflective of you. That’s all. I don’t go to conferences to see General Sessions or Hands On workshops. I go to see the “Boots on the Ground” action from those active in their classrooms. I hope that you consider giving presentations in the future as active teachers have great perspectives and great applicable knowledge to share. This entry was posted in Teacher Education and tagged Arts Integration, Design Thinking, NAEA, PBL, Presentation, STEAM. Bookmark the permalink. 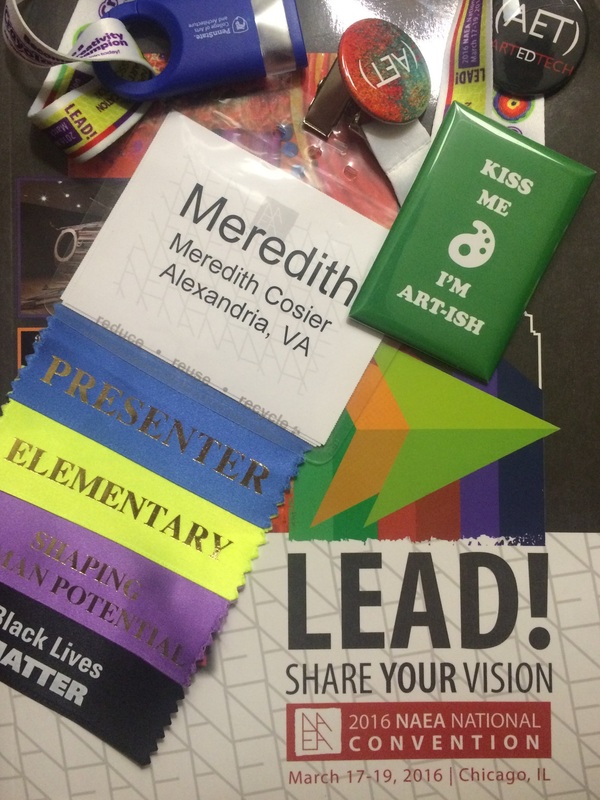 Meredith– you did an AWESOME job presenting at the Conference! I truly enjoyed it and have so many great ideas to bring back to my classroom. Thank you for sharing your ideas and your way of thinking about art… very inspiring and eye opening!! I LOVED it! Thank you for coming and following up! I am in the process of creating a downloadable PDF of the talk and I just updated notes for anyone trying to give a presentation in the future. I hope you got downloaded the resource packet, I took a look at your blog and really thing you should pick up a copy of “Invent to Learn Guide to Fun.” You and your first graders would love all the classroom tech projects and it’s been an inspiration for me.